As you know, we have an online shop. This post is not about that. This post is about the wonderful world of Etsy. In case you don't know, Etsy is a tiny village at the North Pole where little elves make...wait. No, that's Santa's workshop. Etsy is kind of like that, but instead of elves, actual people make things by hand, and via the magical internet (and my credit card), send them to my door. I found these adorable mugs on Etsy. Truth be told, I probably didn't need mugs. But I didn't not need them either. And once I found them I had to have them. While I fully endorse buying local and shopping farmers markets and craft fairs, sometimes the thing you want isn't right where you are. The maker of my mugs lives in Jonesboro, Indiana. I also learned (via her Etsy shop) that her name is Audrey, she just had her first son, and she graduated from Taylor University with a major in Studio Art. And she didn't have 4 of these available in her shop, so she made them for us. So next time you are looking for a gift for yourself or someone else check out Etsy.com. Each shop is individually "owned" so when you type in a search phrase hundreds of different shops might have what you are looking for. It's sort of like window shopping, and when you click a specific item, it's like walking into the shop. You can check out what else they have there, or you can go back out and look at all the shops again. 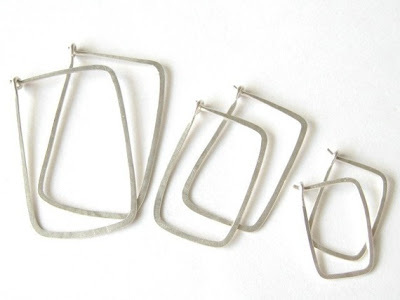 These are some earrings I purchased a while back from Mu-Yin Jewelry when I was searching for "silver hoops." I bought the small ones and they're great. Have fun! One thing I really like about Etsy, is that once you create a profile, you can mark items as your "favorite" so if you find a good gift but aren't ready to buy you can come back later and find your favorites easily. (You just click the heart at the top left corner of the image). I cannot be held responsible for all the money you spend on adorable things. But if you want to thank me for making your gift shopping super easy, you can send me presents. One more note: This is not a paid endorsement by Back Creek Pottery or any other shop I mentioned. I just really happen to like these shops and I have had good experiences with them in the past. Also, many of you probably have known about Etsy for a while, but every now and then I get asked what Etsy is when I tell someone about our online shop. I'm a big fan of Etsy in general. The end.